Ants have evolved to the present forms from the same ancestor with bees, through which evolution process they have simplified their own structure and the behavior of each, whereas cooperative behavior as a mass of them has got more and more complex and sophisticated. Hence, they have obtained various kinds of “social functions” and are now enjoying the highest level of prosperity among various animals on the earth. Mr. Osamu Yamanaka and Mr. Masahiro Nakao, students of the Department of Mathematical and Life Sciences at the Graduate School of Science, along with Professor Hiraku Nishimori, Professor Akinori Awazu and Dr. Masashi Shiraishi have attempted to characterize the long-term foraging behavior of a large number of ants in several colonies using a newly introduced measuring system (Fig.1) recognizing the ID of each ant. Such observation in this study became possible by using very tiny RFID chips (smaller than 0.5mm2, supplied by SK-Electronics CO., LTD. Kyoto) attached to the bodies of individual ants. The existence of the non-uniform distribution of foraging activity among ants in each colony during certain period (Fig.2). 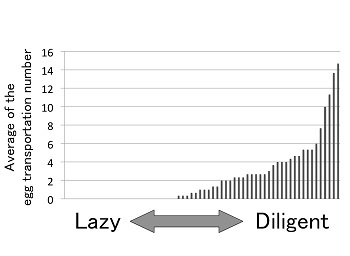 The shape of the distribution is almost similar in each independent colony, indicating the existence of a certain fraction of “diligent ants” and “lazy ants” in each colony, at least in terms of foraging task. In addition, they have recently found that the diligence/laziness of each ant in each colony varies, depending on the temporal crisis of the colony (like removing diligent ants in the colony) to compensate the activity of the colony and may go back to the original state after the crisis. We expect that, the “big-data analysis” of the ants’ society with the use of the “personal data free-of-ethics committee” may give some suggestions for the stably sustained mechanism of a wide range of social organizations apart from colonies of ants. Fig.1 Snapshot from the movie introducing our measuring system. Fig.2 The rank graph of the foraging activity of A species Camponotus japonicus of ants.